Our strawberries are grown in the ground – no tables or poly tunnels! Enjoy the fresh air the birds singing and the pleasure of freshly picked fruit. Let nature feed your senses! We think the fruit tastes better! And even small children can enjoy picking but we do ask to keep them under control and don’t let them run and jump in the field Stick to the straw paths . There are still folk that think they can eat freely in the fields – this is our produce and like any retailer we do not allow eating before you pay, If you woud like to taste please ask our staff on the fruit shed. 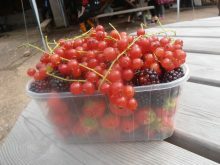 We provide punnets for you to pick in various sizes or you can use a basket or a plastic tub with handles. But you can also bring your own containers We will weigh them before you pick. We can pick for you and we have ready picked on our counter. If you want to place an order please ring Sandra 07971 403823 We have lots of groups who order fruit so let us know if you require a large quantity. Discounts are available for charity events. Who can resist a bowl of freshly picked berries with a generous dollop of cream! Please leave the hulls on – hulls are the green stems on top- They keep much better. Fruit is available in this order starting early June – depends on sunshine and rain!